Victoria’s second Grand Champion in Track and Search for Gordon Setters!! On Friday 30th September 2016, we here at GSCV got told that we had another Grand Champion in Track and Search in Victoria! The first one in Victoria was ‘Mr Darcy’ owned and much loved by Adam, Eddie and Tess Catton but sadly Mr Darcy pasted away earlier this year….. But we have another to join the ranks of Grand Champion in Track and Search, the multi talented ‘Hunty’ TS. Ch T. Ch Neut Ch. Kentigern Dark Highlander CCD RA ET Bred by Eileen and Stan Slabon and lovingly owned and trained by Kaye Yarnold. 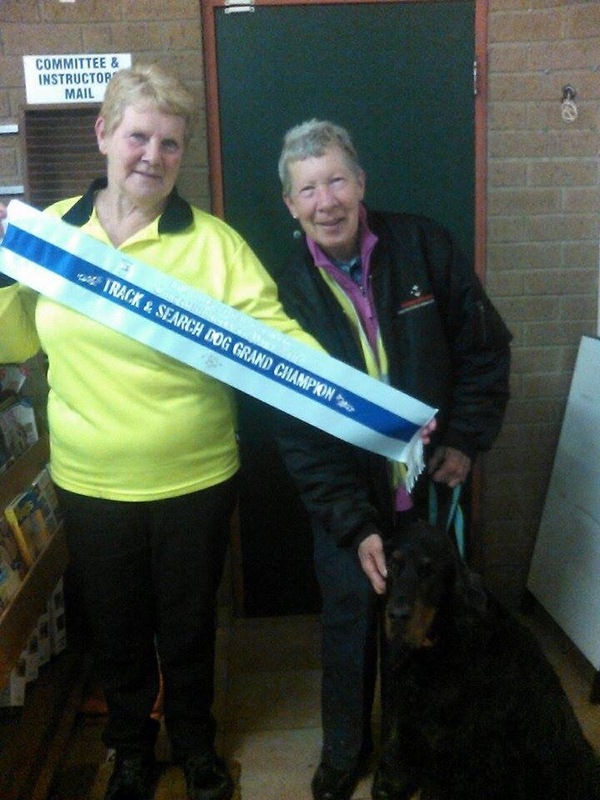 From us here at the Gordon Setter Club of Victoria a big congratulations to Kaye and Hunty on this very special title! !